During the consulship of Lucius Caesennius Paetus and Publius Petronius Turpilianus In AD60 or 61, some 100,000 Iceni, under Queen Boudicca, revolted against oppressive Roman rule and sacked Camulodunum (Colchester), Verulamium (St Albans) and Londinium (London). “Suetonius, undismayed, marched [from Anglesey, where he had been campaigning to crush the stronghold of the druids] through disaffected territory to Londinium. … At first, he hesitated whether to stand and fight there. Eventually, his numerical inferiority … decided him to sacrifice the single city … to save the province as a whole. Unmoved by lamentations and appeals, [he] gave the order for departure. 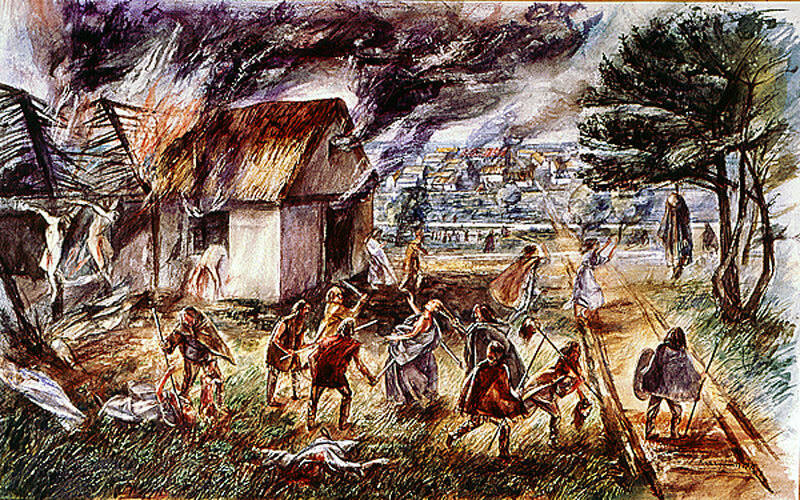 The inhabitants … who stayed because they were women, or old, or attached to the place, were slaughtered by the enemy. Verulamium suffered the same fate. … Roman and provincial deaths at the places mentioned are estimated at 70,000. For the British … could not wait to cut throats, hang, burn and crucify – as though avenging, in advance, the retribution that was on its way [at the Battle of Watling Street]”. This entry was posted in London History, Rebellious London, Roman London on June 5, 2014 by Bob Jones - The Lost City of London.